There's a lot of expert and owner consensus among high chairs this year, making it easy for us to name our top four recommendations. Bubbling to the top are chairs by OXO, Stokke, Graco and Fisher-Price, but we found some great runners up too. The OXO Tot Seedling is one of the best picks on the market for parents who want an easy-to-use high chair without an inflated price tag. Parents love the stain-resistant, machine-washable cushions as well as the well-designed tray that won't wobble and spill messes when resting on the table. Five height settings and three seat recline positions also make the Seedling adjustable enough to accommodate most small babies and toddlers. Sleek, modern and innovative, the Stokke Tripp Trapp is a lifelong investment. Designed to be used from 6 months to adulthood, it is a fully adjustable chair that brings your child to the table right from the start. Parents love the cultivated European beechwood, which comes in several colors; it's also very easy to wipe clean, they say. A tray is available separately to make the chair even more baby-friendly. The Graco Blossom 4-in-1 Seating System accommodates nearly every feeding stage in a child's life with a modular design that transforms it from an infant feeding seat, to a traditional high chair, then a toddler booster, and finally a youth chair. It can even seat two children at the same time in certain modes, making it a good value for many parents. A dishwasher-safe tray, three recline positions and an easy-to-clean, crevice-free design are other favorite features. Inexpensive and lightweight, the Fisher-Price Healthy Care Booster Seat has long been a favorite of parents who want a portable high chair for grandma's house, beach condos or dinners out. It straps to dining chairs to provide a safe, stable spot for older babies and toddlers, and it folds into a more compact package for carrying. Parents rave about how easy the chair is to clean – there is no fabric to stain, and the tray is dishwasher-safe. High chairs are an essential tool for helping tots join in family meals until they're big enough to pull up a chair. Mealtime is an important part of socialization, and there are high chairs to see your child through every stage of eating, including those first finger foods, the picky toddler years, preschool and even beyond. Any high chair worth considering should keep your child safe and comfortable, and it should also be easy to clean and maintain. Since high chairs have a longer usable lifespan than many other kinds of baby gear, design may also be an important consideration -- after all, you'll be staring at whatever you choose for at least two or three years. There is a wide price range for high chairs. Basic models can be $50 or even cheaper, while others can top $200, $300, even $400. Typically, spending a bit extra buys you better materials and a sleeker design; it may also add features such as more adjustability or the ability to convert to a regular chair to accommodate children for longer as they grow. Pricier chairs are also more likely to fold for easier storage. These are meant to be permanent fixtures in your kitchen or dining room. Traditional high chairs boost babies and toddlers to the height of a standard dining room table, though many are height-adjustable. Most include an attachable tray for children to eat from, though some may allow parents to omit the tray and use their table's eating surface instead. This type of chair tends to be more expensive, but also has the longest useful life. These often can convert from baby seats, to toddler seats, to traditional chairs for years of use. Some can even seat two children at once; thus saving money and space. A terrific choice for travel, to keep at grandma's house, or for small spaces, portable high chairs are lightweight and compact. Some portable high chairs sit directly on top of an existing dining chair, boosting babies and toddlers, while others hook on to the tabletop instead. There are even fabric harnesses that attach to chair backs and fold up inside a diaper bag. Expect to spend anywhere from $20 to $80 on a portable high chair, with hook-on chairs being slightly more expensive than boosters. Of course, high chairs are only one of your baby needs. We have recently updated all of our baby reports, so before you buy any other baby gear check out our other reports on baby monitors, portable cribs, baby gates, baby carriers, baby swings, car seats and strollers. Be wary of secondhand high chairs. Newer seats usually meet more stringent safety standards, and plastic or wood can also degrade and crack over time, spurring potential safety issues. Be sure to thoroughly check a high chair if you do buy secondhand, and make sure it hasn't been recalled by searching the Consumer Protection Safety Commission website. In one recent example, Safety 1st recalled about 35,000 Decor Wood high chairs in 2015 because children could remove the trays themselves and fall out. "Chapter 6: Feeding Baby: Breastfeeding, Bottles, High Chairs"
"The Battle of the Best High Chair"
"The Best Full-Size High Chair "
Several experts have conducted comparative, hands-on tests of high chairs. The best resources include reviews and ratings by BabyGearLab.com, TheNightlight.com and ConsumerReports.org. Reviews and ratings that include parent feedback, including resources from "Baby Bargains," LuciesList.com and BabyCenter.com, are also useful. Parents' reviews from Amazon.com, Target.com and BabiesRUs.com provide real-world perspectives on high chairs. We considered reviewers' opinions on ease of use and features while evaluating our sources to help you find the best high chairs. Reviewers say the OXO Tot Seedling (Est. $100) provides admirable features and ease of use without forcing parents to empty out their wallet. It's suitable for children from 4 months to 3 years and comes with blue, green, mocha or graphite cushions and either a light or dark gray frame. Ease of use is outstanding on the Seedling, reviewers report. The straps can easily be removed for extra cleaning, and the wipeable cushions can also be thrown in the washing machine. In tests by TheNightlight.com, the cushions easily repelled pasta sauce, chocolate milk and mashed green beans. Parents say the seat adjusts easily, and they love being able to remove the tray with one hand. The tray also doesn't tip over when it's sitting on its own, better containing messes while parents tend to other matters. The Seedling also has some extra features more common on pricier chairs. There are five height settings, three seat recline positions, and a tray liner that is dishwasher-safe. A five-point harness keeps kids safe, and the tray can even be stored on the back of the seat legs. One major criticism is the amount of room the Seedling takes up, however: As testers with BabyGearLab.com note, the wide-set legs eat up a lot of floor space. The Seedling also doesn't fold flat for storage. Parents who want a fully featured high chair they can use from birth have a formidable option in the Peg Perego Siesta (Est. $300) as long as they're willing to pay the premium price. Like the OXO Tot Seedling, it's suitable until roughly age 3, and comes in several colors including gray, green, raspberry and orange. Testers with Baby Gear Lab say the Siesta boasts durable leather-like fabric that is extremely easy to wipe clean, though they say the chair's crevices may harbor some sneaky crumbs. The tray and tray liner are also easy to wipe and can be put in the dishwasher. Parents say the seat adjusts smoothly and easily, and it goes high enough to raise tots to eat alongside families with counter-height tables. Some say the tray still requires two hands to slide in and out, however. The Siesta really shines when it comes to adjustability: There are nine height positions, five recline positions and a three-position footrest. One of the recline positions is completely flat, making the Siesta suitable for the smallest babies to lie or snooze in. Parents can purchase a High Chair Play Bar (Est. $50) to make the high chair into more of a play seat. Other features include a five-point harness, a large storage pocket on the back of the seat and auto-lock casters that keep the Siesta still until parents want to move it. Though Baby Gear Lab's testers warn that the chair has a large footprint, it does fold flat for storage and can stand when folded. 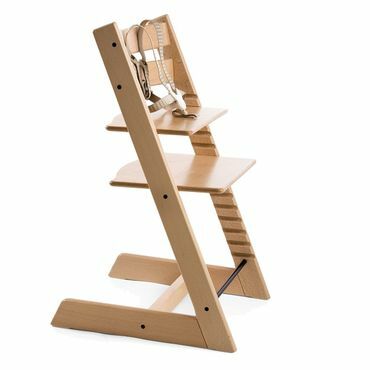 If you prefer a wooden high chair, the Stokke Tripp Trapp (Est. $250) is a highly adjustable and ergonomic seat that grows with children from about 6 months to adulthood. The Tripp Trapp's unusual design brings your baby straight to the table for family dining, but optional accessories can make it a more traditional high chair. Parents like its modern look, wide choice of colors and sturdy build, which they say help justify the high price. Reviewers say the Stokke Tripp Trapp chair is very easy to use. Made of solid wood, the Tripp Trapp wipes clean with a damp cloth, and reviewers say there are few cracks and crevices where food gets stuck. They also say height adjustments are simple. The Tripp Trapp does not have a tray; instead, it's designed to be pulled up to the table like any other chair. Without a tray, however, messes end up on the table and floor. This can be remedied with the purchase of the Stokke Tray (Est. $50), which turns the Tripp Trapp into a traditional high chair. The Tripp Trapp is built to support children from the time they can sit up unaided -- about 6 to 9 months -- until adulthood with a fully adjustable seat height and depth, as well as an adjustable footrest. An included five-point harness attaches to the seatback to secure babies and can be removed for older children. The Stokke Tripp Trapp Baby Set (Est. $70) provides extra security for babies with a high back, solid plastic yoke between the legs and across the midline, and extended gliders. Convertible high chairs are a convenient and potentially money-saving way to get more use out of your high chair. These chairs typically become a booster seat for an older child who no longer needs a standalone high chair with a tray; some even become child seats for older kids. Some may allow use by two children at once in different modes, but double-check before you buy. 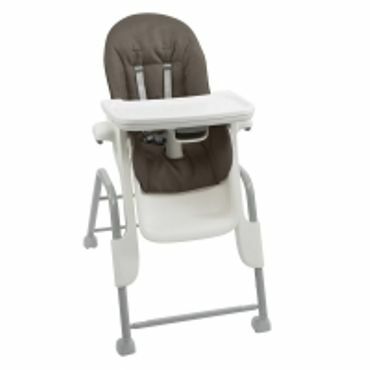 The earns best-reviewed status because it's one of the most versatile high chairs available. Graco markets it as the only high chair you will ever need, even for two children, and many parents and reviewers agree. In its various configurations, it can accommodate newborns, toddlers and children up to a whopping 60 pounds. It's also available in at least a half-dozen colors and patterns. Reviewers say the Blossom is easy to maneuver around the house, even over carpet. Cleaning is a breeze since there are no crevices where food can get trapped. The straps and seat cushion can be removed for cleaning, the large food tray has a removable insert and the entire food tray removes with one hand. Parents find it easy to get children in and out of the seat, and like that they don't have to remove the tray to do so. 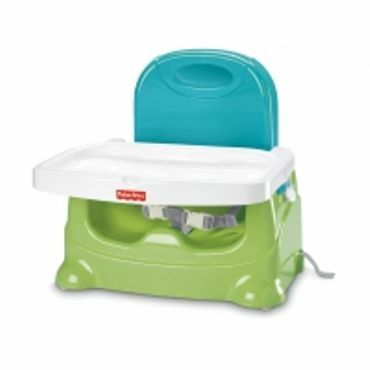 However, the post that sits between the child's legs is attached to the tray rather than the seat, which some reviewers dislike. As testers with Baby Gear Lab note, it makes the tray heavy and means babies can slide down a bit once the tray is removed. And, while the tray is dishwasher-safe, it may not fit in all dishwashers because of that attached seat post. As a traditional high chair, the Blossom can accommodate a child up to 40 pounds, but the similarity to a traditional high chair ends there. A three-position recline, infant support pillow and five-point harness make it suitable from birth for napping and bottle-feeding. The booster and back support portions of the chair can be removed from base and secured to a dining chair, creating a fully backed booster seat for younger babies. The back support can also be removed, converting the Blossom to a toddler booster. The chair base can be used as a youth seat for a child up to 60 pounds. Best of all, the infant booster can be used at the same time as the youth seat, and the toddler booster can be used at the same time as the high chair. The Blossom's harness has two height positions and can convert to a three-point harness for older children. Baby Gear Lab's testers praise the seat's wheels, saying they make it easy to maneuver, but note the Blossom has a large footprint and does not fold flat for storage. For parents looking for a less-pricey convertible high chair, reviewers recommend the Ingenuity Trio 3-in-1 Deluxe High Chair (Est. $80). It has three modes that are suitable from 6 months up to 50 pounds and is available in a handful of patterns with beige or gray accents. Most reviewers say the Trio is easy to clean, with a dishwasher-safe tray and tray insert that can be quickly wiped down. The seat pad and straps are also wipeable and machine washable, though a few parents say crumbs may get lost in seat crevices. They like being able to remove the tray with one hand, though. Experts say it's easy to convert the chair between high-chair and booster modes. The Trio can be used three different ways: as a traditional high chair, a toddler booster that can be strapped to a regular dining chair, and as a stand-alone child seat. The first two modes have a five-point harness, while the child seat has a three-point harness. The booster and child seat can be used at the same time. 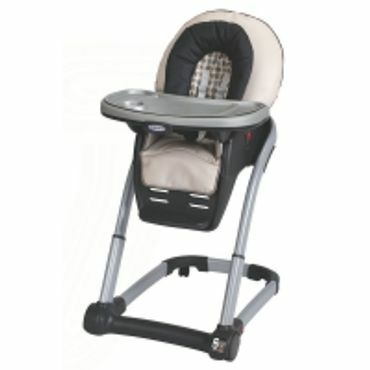 The high chair and toddler booster have three recline positions, and the tray can be locked in four positions to accommodate growing children. Experts wish for an adjustable footrest and say the attached wheels aren't the smoothest. This seat also does not fold flat for storage, but it has a small footprint even in full high-chair mode.